October long-known as “Breast Cancer Awareness Month”, is also a month dedicated to women’s health awareness. More recently, November has become host to the growing movement toward men’s health awareness known as “Movember” or “No Shave November.” Movember is signified by the growing of facial hair as an outward showing of support for men’s health awareness. In support of both women’s and men’s health awareness, the Hillsborough Township Police Department participates in annual fundraising campaigns during the months of October and November. This year, all Hillsborough Township employees were invited to participate alongside the HTPD. Participating employees wore a pink ribbon pin throughout October and a blue “Movember” pin in November. 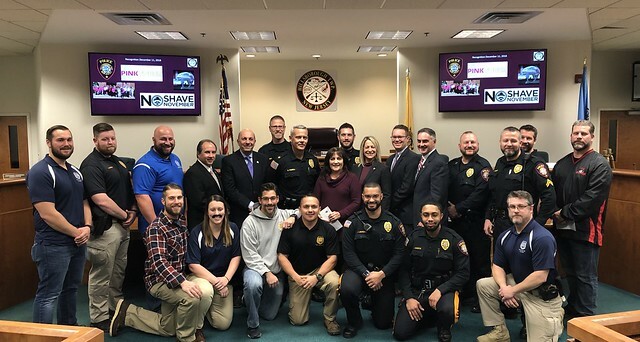 Hillsborough Township Police Chief Darren Powel, Mayor Gloria McCauley, Deputy Mayor Doug Tomson, Committeeman Frank DelCore, Committeeman Shawn Lipani and Committeeman Carl Suraci are joined by members of the Hillsborough Township Police Department.